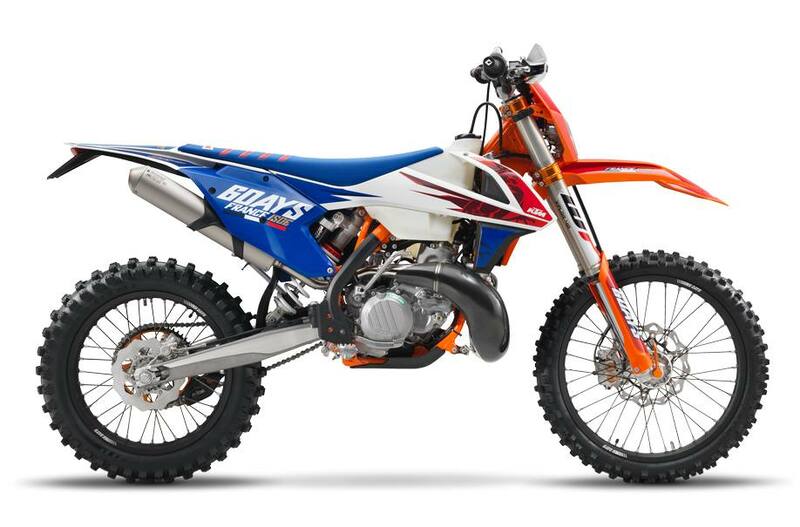 KTM has ruled off-road for decades. The special edition Six Days models celebrate this success with special performance upgrades and top-of-the-line components. 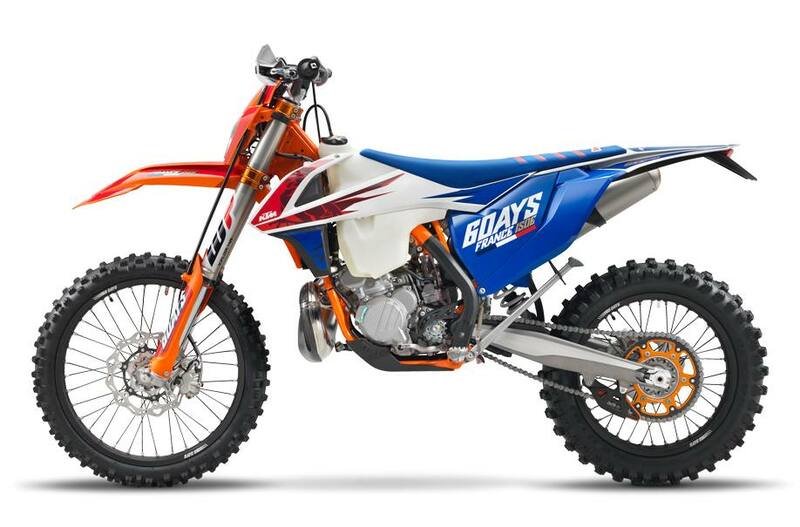 In 2017 the ISDE (International Six Days of Enduro) will be held in Brive-la-Gaillarde, France and the KTM model line-up has been suitably equipped to handle anything the muddy and rocky terrain can throw at it. Bodywork: KTM R&D, KISKA Design and the factory racers all had their say in shaping the plastics with one goal: complete harmony between rider and bike. Perfect ergonomics and contact points provide maximum comfort in movement on the XC-W. The I-beam structures of the front and rear fenders guarantee maximum stability and a low weight thanks to well thought-out construction and mounting. They also stay cleaner for longer. Clever brake hose routing on the front number plate prevents wear and tear. Handlebar: KTM engineers know how to handle handlebars. This tapered unit, made of high-strength aluminum by NEKEN, features a newly developed throttle assembly with a robust aluminum body and easy free-play adjustment. An ODI volcanized grip sits on the right, while on the left side of the bar a comfortable ODI lock-on grip requires no glue or wire to secure it. Seat: Tailored to meet the needs of the world’s fastest backsides, this durable seat offers great comfort, helping you master the most challenging terrain all day long. Front suspension: The WP Xplor 48 upside-down fork is a split fork developed by WP in close collaboration with KTM. It is fitted with a spring on both sides but features separated functions for each fork leg: compression damping is fitted on the left side, while rebound is on the right. The forks can easily be adjusted for compression and rebound with the twist of a dial on the top of the forks. New outer fork tubes and a reworked setting make for more sensitivity, improved damping behavior and a reduced weight. In addition, a sealed hydro-stop guarantees excellent resistance to bottoming-out. Due to high-quality materials and a state-of-the-art production process, the new WP Xplor 48 fork – with approx. 300mm of travel – has outstanding response and damping characteristics. A comfortable preload adjuster is Sixdays standard and allows for a simple spring preload setting in three steps without tools (standard, +3mm, +6mm). Frame: The high-tech, lightweight chrome-moly steel frame has a knack for easy handling, outlandish rideability, precise cornering and excellent stability. You can also count on high torsional rigidity and low longitudinal stiffness. This results in better absorption of the energy created from the front and rear suspension sucking up jumps and bumps. In short: more comfort and less rider fatigue. Laterally attached, lightweight engine head stays (the connection between cylinder head and frame) contribute to a reduced vibration level. Two threaded inserts in the lower cradle tubes allow for safe fixation of an optional skid plate. The engineers could pull off all of this while making the frame 2.2 pounds lighter than that of the lightest competitor on the market. In addition, it is easier to maintain, easier to work on and supplies more space for the tank and other components. The bike also features an extra-light subframe made of high quality aluminum, which tip the scales at less than 2 pounds. Triple clamp: The 300 XC-W is fitted with high-end CNC machined triple clamps anodized in orange and an offset of 22mm, ensuring a solid grip of the fork and precise handling. The handlebar is adjustable forwards and backwards over 4 positions, so the bike will fit you like your favorite gloves. Brakes: You can’t brake any harder, better, faster or stronger. High-tech Brembo calipers are combined with lightweight Wave brake discs. Up front a floating rotor ups the SIX DAYS braking game and a solid rear rotor is ready for the worst you can throw at it. The steel-flex front brake hose has efficient protection and there’s an integrated channel for the speedometer cable. First you outrun them, then you outbrake them. Suspension travel (front): 11.81 in. Steering head angle: 63.5 deg. Weight READY TO RACE (without fuel): 221.56 lb. Suspension travel (rear): 12.2 in. Tank capacity (approx. ): 2.64 US gal.